I just pulled the numbers for Detached home sales in Markham from April to August 2018. Have a look at a few simple graphs to give you a quick update on what is going on in our market. If you are in the market to purchase in Markham, sales for Detached homes in Markham were down last month by 20% from the month prior with the average price remaining about the same and averaging 3 more days on the market. This is not ideal for home owners looking to sell at this time, but those looking to buy in this area may do better. As an example, I was able to sell my clients home in Toronto with multiple offers achieving a sale price of 121% of asking price while purchasing a home in Markham for them at only 91% of asking price. This created a huge savings for them! 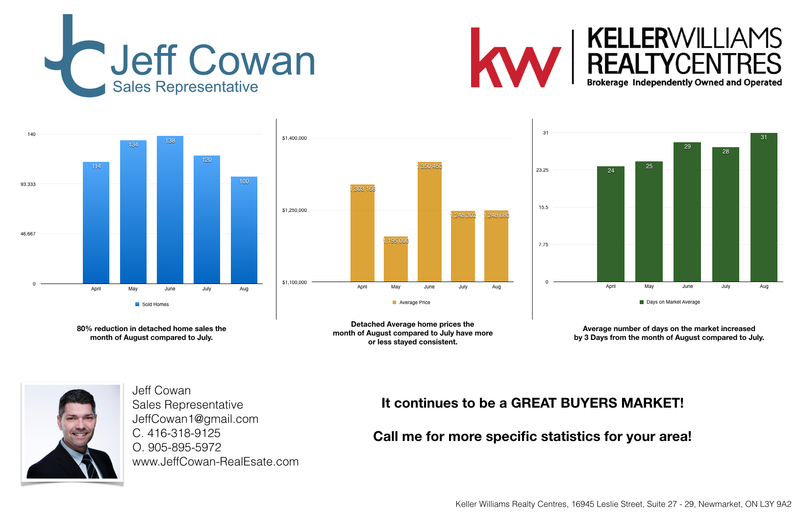 Feel free to reach out to me for any clarification on the statistics or if you wanted to see different statistics for a specific area or style of home. I would be more than happy to help out.